Is artificial grass infill necessary? Some people make the mistake of thinking infill isn’t necessary because artificial grass blades are designed to stay upright. Additional support isn’t the only reason to install artificial grass infill. Protecting your lawn from UV rays (as well as wear and tear) is another. That’s why Watersavers Turf offers quality artificial grass infills like ZeoFill and Superfill. Our synthetic turf products are tested to ensure they’ll stand up to UV rays. You can view our certifications and learn all about our testing process online. That said, infill further protects fake turf from UV exposure. Infill protects fake turf from UV exposure by adding extra protection to its backing. Since infill protects fake turf from UV exposure; it extends its longevity. Without it, the lifespan of your turf will be a lot shorter if you leave it out in the sun. Therefore, it makes good sense to install it. Why Infill Increases Turf Lifespan: A high-quality weed barrier that’s designed to last 20 years would last closer to five years if you just left it out in the sun without additional protection like mulch or ground cover. Turf backing is similar in that it needs additional protection to extend its lifespan. Turf blades are already designed for reducing exposure to UV rays. However, infill adds yet another layer of protection from the sun. Fire Safety: Through processes like the smoke density chamber test and radiant floor panel test, we’re able to confirm that our products are safe, even when exposed to open flames. Adding an infill further boosts the turf’s fire safety rating. This makes it safer for outdoor and indoor use. How Much: One pound of infill sand or sand-like material such as ZeoFill per square foot of turf is usually enough to protect the weed barrier from UV rays. Ideal Uses: When you install plastic grass over a permeable surface, like soil, you can decrease contraction or expansion further by adding infill on top of a grid pattern of nails. Adding infill is even more important when installing the turf over concrete or a similar surface where nails cannot be used. You need to add weight to keep the overall size and shape of your turf consistent. How Much: The amount needed is the same for UV protection which is 1.5 pounds of infill per square foot of turf. This will add sufficient weight to keep your artificial grass uniform. It’s also important to know that infill adds more support to artificial grass blades. Even though we test our products to ensure they remain durable and upright, a lot of foot traffic can mat down the blades over time. When you add infill to support artificial grass blades, this happens less often. That means you don’t have to spend as much time brushing or brooming them back into place. Since infill adds support to artificial grass blades, using it reduces the amount of lawn maintenance. Adding Ballast: When you add “ballast” or support to your lawn, the fibers “remember” their original, upright positions more reliably. This makes them less vulnerable to wear patterns. Key Uses: Any lawn people spend time on benefits from extra support. That said, it’s especially important to add extra support to other areas such as sports fields. Sports fields get a lot of wear and tear. However, so do commercial properties that receive heavy foot traffic. Infill is great for these of areas as well. Home Lawns: Your backyard won’t get as much traffic as a football field. It only needs 1.5 pounds per square foot of turf to add the needed support. Sports Fields: Athletic fields need anywhere from 3 to 12 pounds of infill per square foot based on the type of turf product installed. This helps the blades stand up to intense game play. Playgrounds: Playgrounds get a lot of foot traffic, but children will exert less force over your blades than a football player. That’s why 1.5 to 3 pounds per square foot is a good general rule for playgrounds. Rule of Thumb: Again, you have to account for many factors when choosing the proper amount of infill for a high-traffic area. In general, you should install enough so only ½” to ¾” of the turf fiber is exposed. That’s why it pays to discuss your plans with our team. They’ll help you calculate the right amount based on the type of infill you’re using and the type of turf you’re installing. Less Abrasive: This infill is rounded sand that has been colored green. This makes it less abrasive than natural sand. Antibacterial: This product has an environmentally-friendly antibacterial coating (Arch Biocide). This helps prevent mold, mildew, and bacteria from growing. Organic: ZeoFill is actually Zeolite which is a mineral from mother earth. This means it’s 100% organic and won’t harm the planet. Reduces Odors: ZeoFill stops pet odors before they start by breaking down the ammonia in urine before it turns into a gas. The gas is what causes the foul odor. That is why this product is also used in no-clump cat litter. Economical: This is a budget-friendly infill that can be combined with many other types of infill. Natural: This product is 100% natural, and therefore non-toxic. 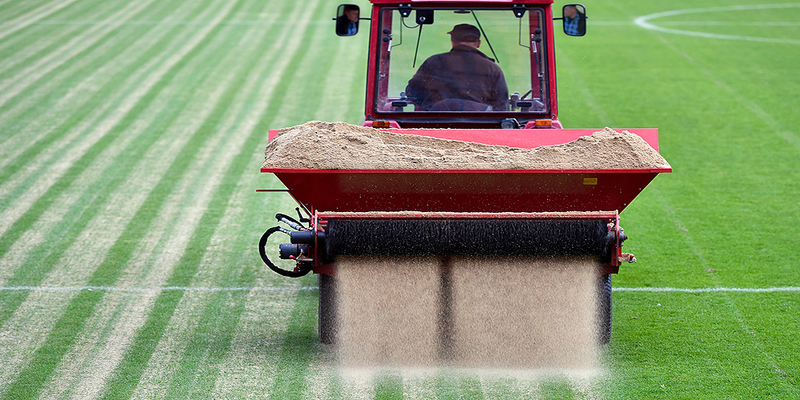 Prevent static electricity build up: Silica sand not only gives stability to your artificial turf fibers, but it also helps avoid the formation of static electricity. Static electricity naturally occurs in products with poor conductivity. We also should mention that we offer the FreshCut Scent product. This item makes your grass smell even better by naturally mimicking the scent of freshly-cut grass. To learn more about the benefits of infill, head to one of our SF Bay Area locations. Our team will gladly answer your questions. They’ll also be happy to offer free large 1’ x 1’ turf samples. If you can’t make it to us, we’ll ship them to you. There is no shipping fee for contractors. If you’re not from the area, just call us toll-free at 844-974-8873 with your questions and ask about our free estimates and delivery offers. If you have any questions about installing artificial grass, we have a detailed online guide.